Thomas Corbett. Photo: Catherine Fry. Enabling farmers to have more individual control over monitoring of their freshwater and subsequently adjusting their land management practices for individual pasture – to reduce nitrate and phosphate leaching – is the crux of research being undertaken by Thomas Corbett. 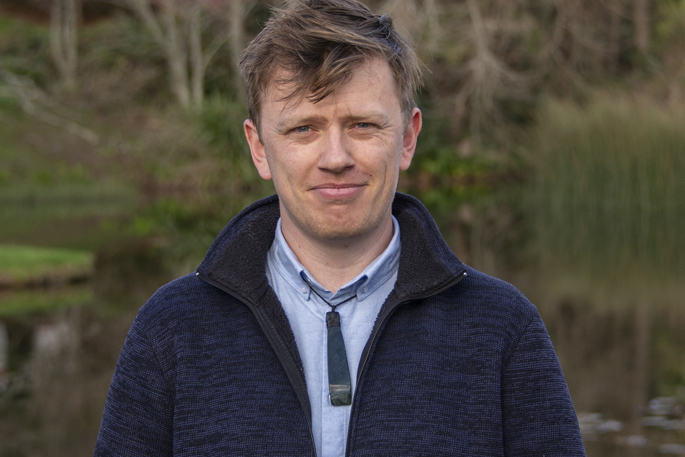 The Waikato University PhD student was awarded a Ministry of Primary Industries’ postgraduate scholarship worth up to $50,000, to develop a nitrate/nitrite and phosphate freshwater sensor earlier this year. After a three-year travel break – including a stint running a bed and breakfast in Wales – Thomas returned to New Zealand and applied to Waikato University to study for his Masters. When discussing his research interests with his now supervisors Professor Louis Schipper and Dr Adam Hartland presented him with a research proposal and opportunity to undertake a PhD extending the Diffusive Gradients in Thin Films – known as DGT – technology. Development of DGT technology began in the 1990s, and extended to nitrate/nitrite more recently, but it has not widely been taken up, says Thomas. “Current testing involves taking a water sample and sending it to a lab for analysis,” says Thomas. The research focuses on extending the technology so analysis can be undertaken in-field, enabling farmers to have more individual control over the monitoring of their freshwater. “The tricky bit is incorporating the chemistry that would enable in-field testing into the DGT device,” says Thomas, whose academic’s credentials include a BA/BSc was in politics, philosophy and chemistry “because he felt the mix was “good for his critical thought and writing skills” followed by a First Class Honours degree in computational chemistry. Thomas says DGT technology is a passive sampling technique whereby dissolved species diffuse through a diffusion layer, and are selectively bound by an inner resin, the accumulated mass is then used to calculate a time-weighted average concentration. Alongside lab development, Thomas will conduct trials in the field as he continues to develop the final tool.